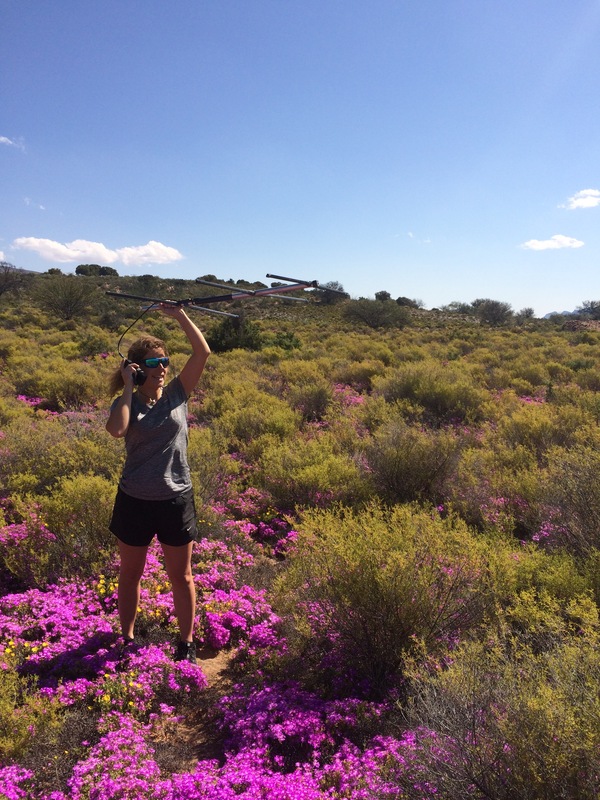 Spring is a great time to do fieldwork in the Karoo: it is not too warm or too cold, flowers are beautiful and it is dry. 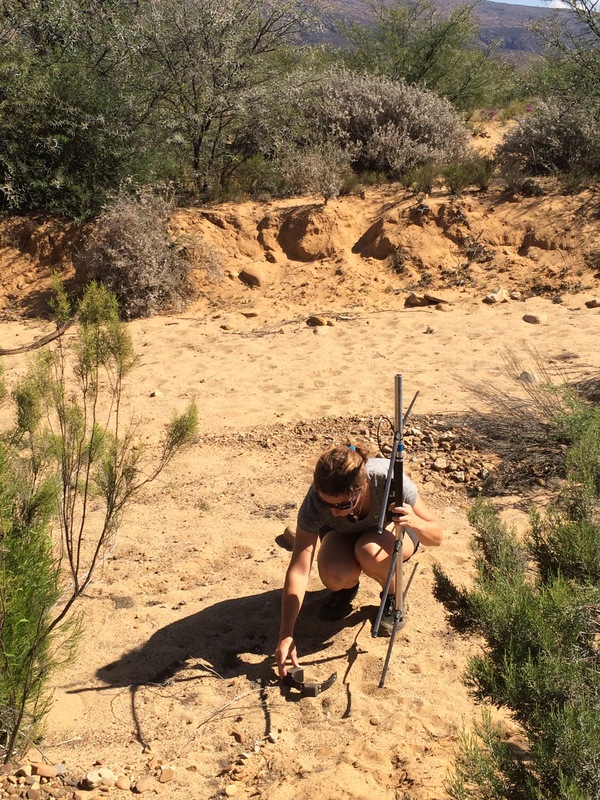 Last week-end, Marine and Kai went to Anysberg Nature Reserve in the Klein Karoo to collect one of the black-backed jackal’s collars that Marine had dropped-off because the battery was running low. The collar fell and the team entered the GPS coordinates in the good old hand-held Garmin and set up for a nice hike. They reached the riverbed where the collar was supposed to have dropped-off and after a very short search, found it in an opened sandy patch. Kai entering the GPS readings to find Luna’s collar. Marine VHF-tracking Luna’s collar in Anysberg Nature Reserve. The trip was also a good opportunity to investigate some GPS clusters from the same jackal (the female Luna). After finding a few resting/bed sites, but unfortunately no kill sites, Kai and Marine found a den! It was a hole dug in the sandy ground, with lots of jackal scats and tracks all around. In spite of these signs, the den is probably a secondary sleeping site for the family because no regurgitation remains from the parents were found and not enough scats from the pups either. The search was successful and Luna’s collar was recovered. Two more collars are still running in the Karoo, one on the old male caracal Whisky and one on the even older male jackal Eskimo. We will keep you updated on these collars data! 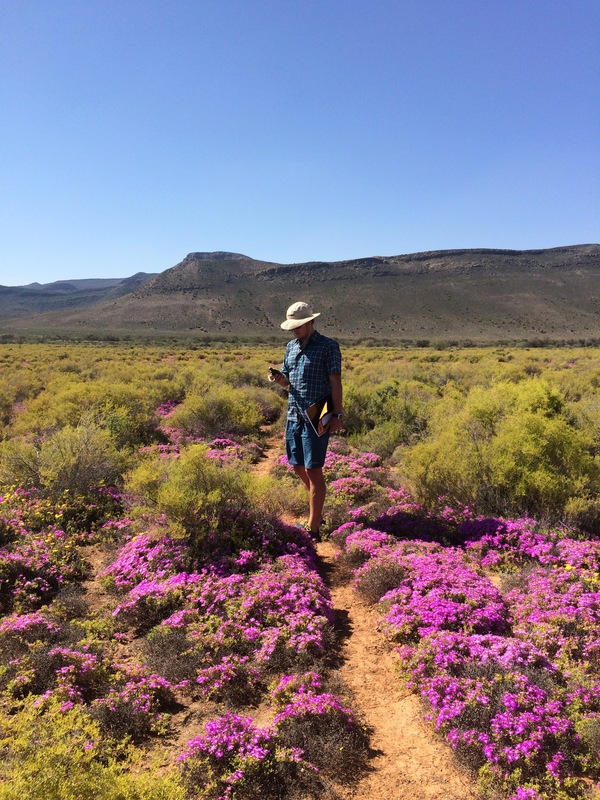 This entry was posted in Uncategorized and tagged anysberg, GPS collar, jackal, karoo, predator, reserve, VHF. Bookmark the permalink.